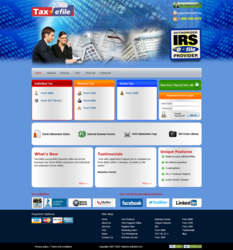 Tax2efile has launched a new site Etax7004.com for e-filing Form 7004- Request for Automatic Extension. Tax2efile is an online tax filing service designed to assist individuals and businesses in filing their federal tax return and extensions with IRS. There service enables users to file their returns electronically as well as by traditional paper filing. Tax2efile puts the customer first and has launched a new site dedicated to assisting e-filers. Tax2efile is recognized as a leader in E-Filing Services. With an easy to use website and Live customer support from an experienced and well trained staff Tax2efile is always offering their customers the best experience possible. In keeping with tradition Tax2efile is always pushing forward offering their customers new and innovative services designed to help individuals and businesses complete their tax filing needs. Newest to the list of forms offered from Tax2efile is Form 7004 and with it a dedicated site has been launched for e-filing form 7004 at Etax7004. The official name of Form 7004 is Application for Automatic Extension of Time To File Certain Business Income Tax, Information, and Other Returns. This form is used to apply for an extension to file a business’s taxes. Tax2efile is an IRS Authorized company.